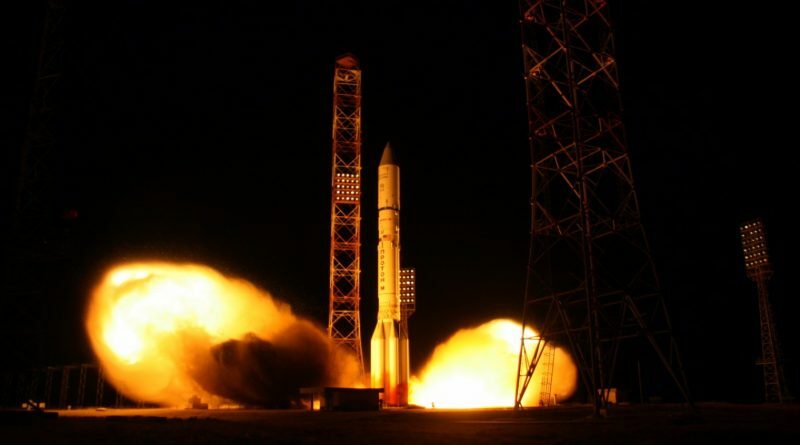 Just two and a half weeks after making its last orbital delivery, Russia’s Proton-M rocket lit up the night over the Baikonur Cosmodrome again on Thursday – blasting off toward orbit with the heavy AsiaSat 9 communications satellite that aims to replace an aging spacecraft and expand TV and networking coverage in the Asia-Pacific Region for satellite operator Asia Sat. 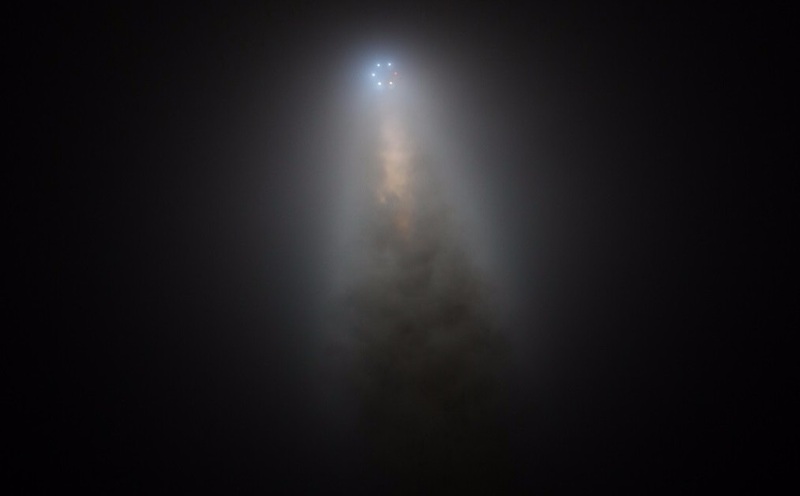 The 58-meter tall heavy-lift rocket blasted off from Baikonur’s Site 200/39 at 18:52 UTC, 12.52 a.m. local time on Friday, taking to the skies with the U.S.-built AsiaSat 9 for the vehicle’s third commercial launch of the year and the second in the current calendar month. Firing its three rocket stages in close succession, Proton successfully dispatched its Briz-M upper stage onto a sub-orbital arc from where it lifted the stack into a low orbit and then completed a methodical maneuvering campaign to boost the 6,140-Kilogram satellite to a Geostationary Transfer Orbit. AsiaSat 9, the tenth satellite commissioned by Hong-Kong-based Asia Sat, separated from the upper stage nine hours and 13 minutes after its late night liftoff; 4:05 UTC on Friday, September 29. Thursday night’s launch marked the fourth Proton mission in 2017 as the vehicle slowly finds its way back to old strengths with Proton manufacturer Khrunichev and commercial operator ILS hoping to fully overcome reliability struggles and a systemic manufacturing problem related to Proton’s engines that kept the vehicle on the ground for a full year. Starting in 2010, Proton encountered at least one outright failure, partial failure or close call per year due to issues introduced during manufacturing and procedural errors. Proton stood down from June 2016 after a close call on the Intelsat 31 launch that suffered a premature shutdown on one of the rocket’s four second stage engines. Although the underperformance was fully compensated by the Briz-M upper stage, the anomaly was probed extensively and revealed a potentially serious problem on the rocket’s second and third stage engines as some were found to have been manufactured using an improper soldering material, introducing a weak point in a critical part of the engine where liquid propellants turn into extremely hot, high-pressure gas. 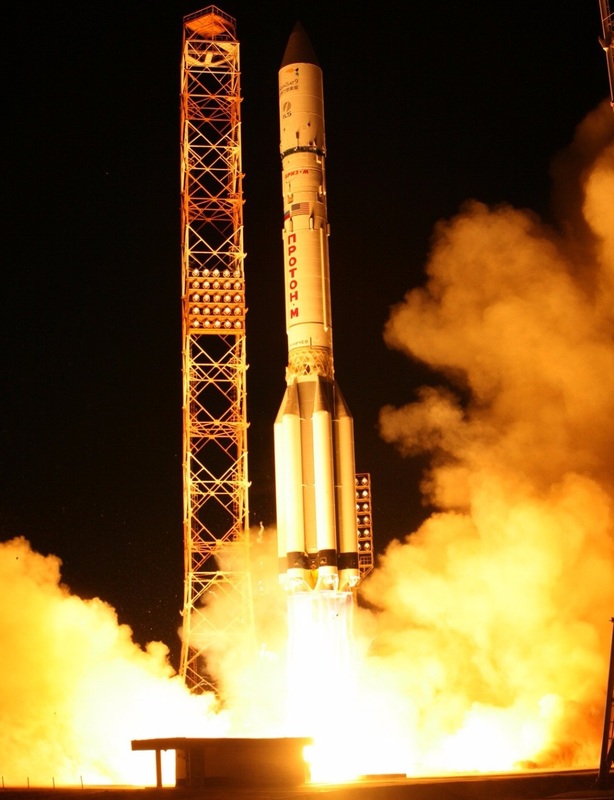 As a result, all engines were recalled for refurbishment and it took until June 2017 for Proton to return to flight with the EchoStar 21 satellite. 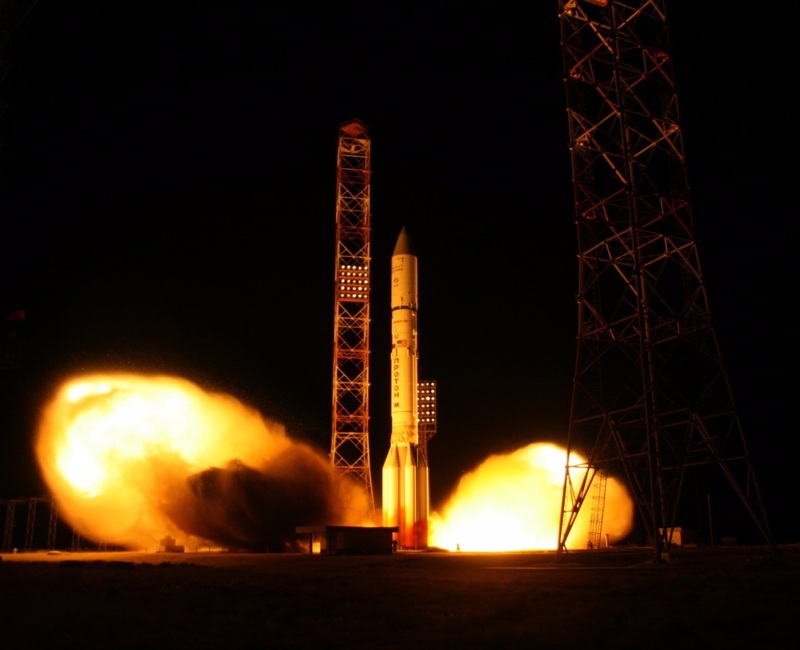 Proton flew again in August on a mission for the Russian government, lifting the first of four Blagovest dual-use communications satellites into orbit to provide high-throughput communications services for the Russian military as well as civilian application. The heavy-lifter checked off its third successful flight in a row on September 11 when lifting the Amazonas 5 satellite with AsiaSat 9 already deep in its processing campaign at the time. One more Proton is left on the 2017 manifest, targeting a December liftoff with the second Blagovest satellite. 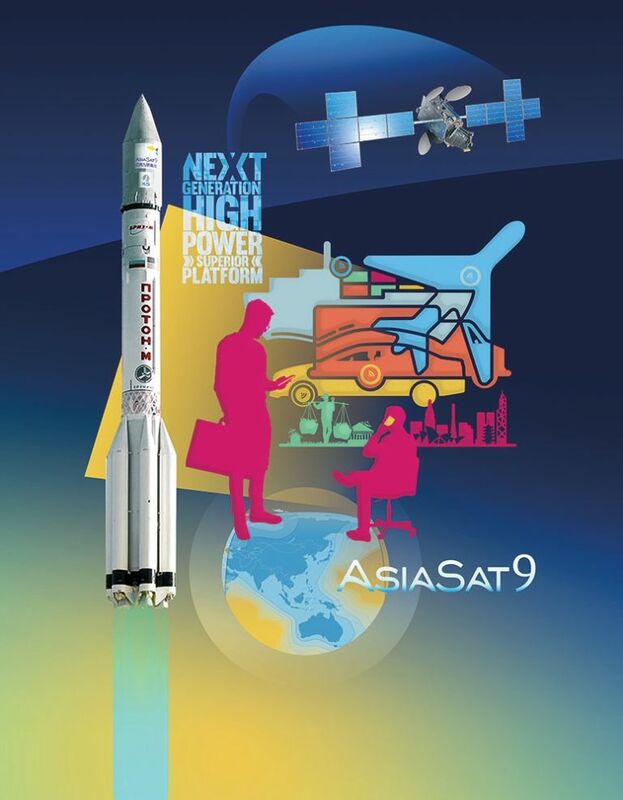 The payload of Thursday night’s mission is AsiaSat 9, joining Asia Sat’s fleet of satellites delivering the entire palette of communications services from high-altitude parking spots in Geostationary Orbit that allow the satellites to remain locked over the same position of Earth’s surface. Built by Space Systems Loral in California, AsiaSat 9 uses the popular SSL-1300 satellite platform and hosts a powerful tri-band communications payload comprising 28 C-Band and 32 Ku-Band transponders as well as a high-throughput Ka-Band package to support TV and video distribution, private networking and broadband services. 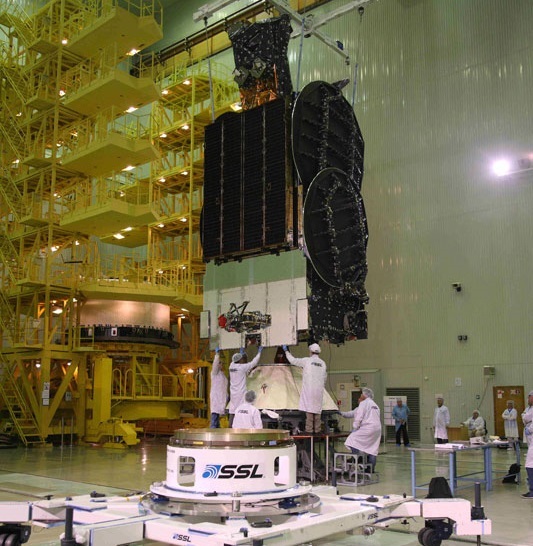 The AsiaSat 9 spacecraft will be stationed at 122.2 degrees east in Geostationary Orbit where it will replace the Boeing-built AsiaSat 4 satellite launched in 2003 and approaching the end of its planned 15-year service life. 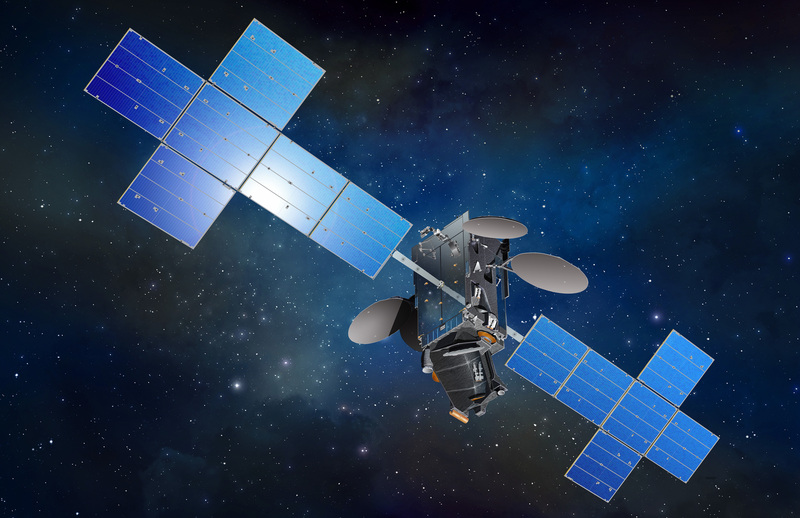 The C-Band payload on AsiaSat 9 has the highest transmit power in the Asia-Pacific Region and offers a 23% throughput increase over the AsiaSat 4 satellite. Five Ku-Band coverage zones are provided by the satellite, adding three new zones not previously supported by AsiaSat 4 and introducing flexible cross-strapping and beam switching to direct coverage where it is needed. The high-power Ka-Band terminal will be available for data-intensive networking applications. Coming right on the heels of the Amazonas 5 launch, Thursday night’s mission required a fast turnaround of the Site 200/39 launch pad, typically used for commercial missions of Proton. 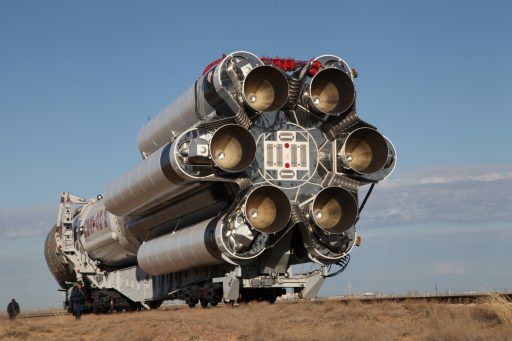 AsiaSat 9 arrived at Baikonur back on August 27 and headed into Integrated Operations on September 17 for the assembly of the Orbital Unit and installation on the three stage rocket for rollout to the Briz-M fueling station on Sunday. 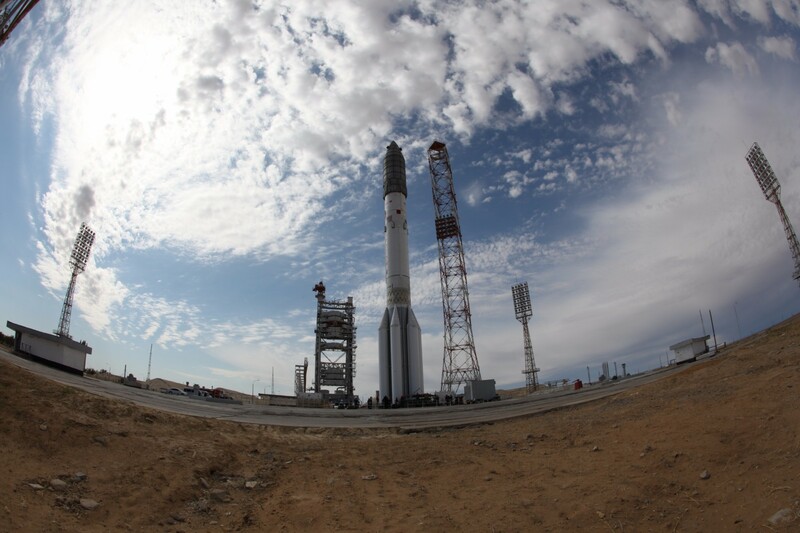 With the Briz-M loaded for flight, Proton completed an early morning rollout to the pad on Monday, set for a three-day on-pad campaign for final testing and preparations for a lengthy countdown operation. The 11.5-hour launch countdown kicked off with the activation of the Briz-M upper stage for a final checkout before loading its flight software, containing all the instructions and orbital parameters for its mission of 9+ hours. Proton was powered up around the seven-hour mark in the countdown for its final set of checkouts and the hazardous tanking sequence, kicking off as sunset approached over the Baikonur Cosmodrome. As part of the three-hour fueling operation, Proton received 622 metric tons of Unsymmetrical Dimethylhydrazine and Nitrogen Tetroxide – a self-igniting propellant combination used by all of Proton’s stages, including the Briz-M. Standing fully fueled, Proton was revealed atop its pad one hour before launch when the large Service Structure was rolled back from the rocket, marking the start of final flight control reconfigurations and the last preparatory steps on the satellite side. Proton entered its automated countdown sequence at T-5 minutes when the launch key – a relic of the rocket’s ICBM heritage – was inserted to set in motion the final critical steps including the pressurization of tanks, the transfer to internal power and the handoff to Proton’s flight control system for a final automated health check before engine ignition. 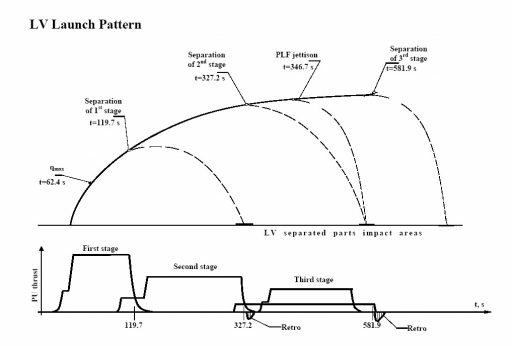 Proton came to life at T-2.5 seconds when its six RD-275M engines were commanded to fire up – initially going to a preliminary thrust level for a health check and then soaring to a combined liftoff thrust of 1,014 metric ton-force. Liftoff occurred at 18:52:16 UTC when Proton’s thrust overcame the rocket’s launch mass of 712 metric tons, starting an initial vertical climb before the vehicle began pitching and rolling to attain a launch azimuth of 61.3 degrees – the standard route for a GTO mission out of Baikonur, taking the climbing rocket to the north-east toward the Russian border. Burning some 3,500 Kilograms of propellants per second, Proton quickly accelerated beyond the speed of around and passed Maximum Dynamic Pressure one minute into the flight. By T+1 minute and 42 seconds, Proton only weighed half of what it did at liftoff, having consumed the majority of the 419-tonne propellant supply on its first stage, held in a large central tank and six strap-on type tanks clustered around the stage. The first stage departed the rocket one minute and 59 seconds into the mission as part of a hot-staging sequence that ignited the four-engine second stage just as the first stage finished its job followed by the pyrotechnic separation of the 21.2-meter long booster, headed toward a crash landing 310 Kilometers from the launch pad. Soaring to a thrust of 245 metric ton-force, the second stage was set for a three-minute and 28-second burn of its RD-0210/0211 engines to lift the vehicle out of the atmosphere. The launch bunker continued reporting good flight parameters as the second stage burned 156 metric tons of hypergolics and raced downrange from the remote launch site in the Kazakh steppe. Hot-staging was also employed between the second and third stages, starting with the ignition of the four-chamber vernier engine on the third stage at T+5 minutes and 24 seconds followed three seconds later by shutdown and separation of the 14.5-meter second stage, headed toward a crash landing nearly 2,000 Kilometers from the launch site. The third stage pulled away from the spent second stage under the power of its three-metric ton vernier engine before firing up the RD-0213 main engine, increasing the third-stages thrust to 63,000 Kilogram-force for a four-minute burn. Twenty seconds after staging, Proton split open and jettisoned its two fairing halves, shedding some two metric tons of no-longer needed weight as the vehicle had departed the dense atmosphere by that point. The third stage shut down its main engine nine minutes and 31 seconds into the flight after consuming nearly 45 metric tons of propellant while the vernier engine continued firing for another ten seconds. 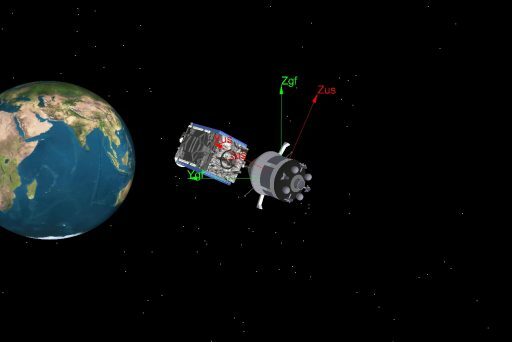 Separation of the Orbital Unit comprising the Briz-M and the AsiaSat 9 satellite was confirmed nine minutes and 42 seconds after launch, marking the end of Proton’s mission and checking off its fourth success of the year. It was then up to the Briz-M upper stage to finish the job of sending AsiaSat 9 into its target orbit – requiring a five-burn mission profile by the upper stage taking just over nine hours after separation from the Proton. Assuming control of the flight, the 22,170-Kilogram upper stage was first tasked with stabilizing its orientation and coasting for 94 seconds before firing up the 2,000-Kilogram-force S5.98 engine 11 minutes and 16 seconds into the mission. This first burn, planned to be 4 minutes and 20 seconds in duration, was designed to transition the craft from a sub-orbital trajectory into a Low Earth Parking Orbit of 168 by 179 Kilometers at an inclination of 51.6 degrees. Having achieved orbit, the stack coasted for half a lap around the planet so that the second burn could occur on the ascending node of the orbit, centering the equator in order to place the high point of the resulting elliptical orbit above the equator on the opposite side of Earth. The second S5.98 burn was expected to last 17 minutes and 52 seconds, stretching from the Atlantic near the South American coast to the Mediterranean, targeting an orbit of 270 by 5,000 Kilometers. Briz-M can not complete the apogee-raising to Geostationary Altitude in a single maneuver given its low-thrust engine. Therefore, another lengthy coast came after the second burn so that the next maneuver could occur around perigee of the transfer orbit and boost the apogee to the desired GEO altitude. Re-start was planned three hours and 28 seconds after launch for an 11-minute and 33-second burn that depleted the 14,600-Kilogram propellant load of the Auxiliary Propellant Tank carried by Briz-M.
Briz-M shut down its engine and dropped the tank three hours and 40 minutes into the flight, then re-lit the S5.98 on a planned six-minute and three-second burn to reach a 434 by 35,805-Kilometer orbit, 49.2°. The combined 3rd & 4th burn ran from the west coast of South America, across the Atlantic and to the Moroccan coast. Next was the longest coast phase of the flight, taking five hours to allow Briz-M to climb up all the way to the high point of its orbit in order to execute a major plane change and raise the perigee with its fifth and final burn – expected to commence eight hours and 53 minutes after launch to lift the stack into an orbit of 4,045 by 35,786 Kilometers, inclined 23.4 degrees. 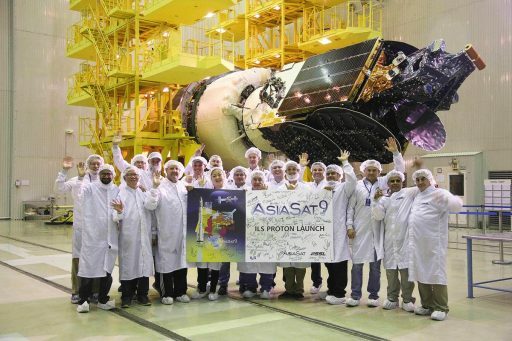 Separation of AsiaSat 9 was confirmed at 4:05 UTC on Friday, marking the start of its 15-year mission that will initially see the satellite maneuver into Geostationary Orbit, deploy its appendages and go through a commissioning and testing phase before being turned over to Asia Sat for operation. Briz-M will be tasked with a pair of maneuver to enter a graveyard orbit some eleven hours after launch.